Magnesium is an important mineral that your body needs for a variety of functions, from building strong bones to regulating your heart rate. Whether you are taking magnesium supplements due to a deficiency or for an experimental migraine treatment, magnesium can usually be taken safely with food and other minerals. Of course, magnesium is also found naturally in many commonly eaten foods. Magnesium is one of the most common minerals in your body, necessary for over 300 biochemical reactions, according to the Linus Pauling Institute. One of magnesium's key functions is working with calcium to build strong bones. Over half the magnesium in your body is found in the bones. Magnesium is also necessary for the metabolism of energy from food. Finally, magnesium plays important roles on the cellular level, helping build strong cell membranes, transport ions across the membranes and sending signals between cells. While your diet typically provides most of the magnesium you need, your doctor may prescribe a supplement if you are at risk for a deficiency. Disorders like diarrhea, Crohn's disease and other gastrointestinal or renal disorders increase your risk of deficiency. In addition, magnesium supplements can be used to treat conditions like preeclampsia, hypertension, and migraine headaches. The supplements used to treat such health problems are a typically high dosage, so use with caution as directed by a physician. Neither the University of Maryland Medical Center nor the National Institutes of Health report any interactions between magnesium and other mineral supplements. High doses of zinc supplements may inhibit your body's ability to absorb magnesium, so your doctor may have you pair a zinc supplement with a magnesium supplement. Furthermore, vitamin and mineral supplements can cause an upset stomach when taken without food. If your stomach is sensitive, take your magnesium supplement with food to help prevent a reaction. While magnesium that occurs naturally in your diet does not usually cause negative side effects, you do need to use caution when taking a magnesium supplement. Since the magnesium doses used to treat migraines and other conditions can be high, make sure you use them carefully in order to prevent a toxic reaction. 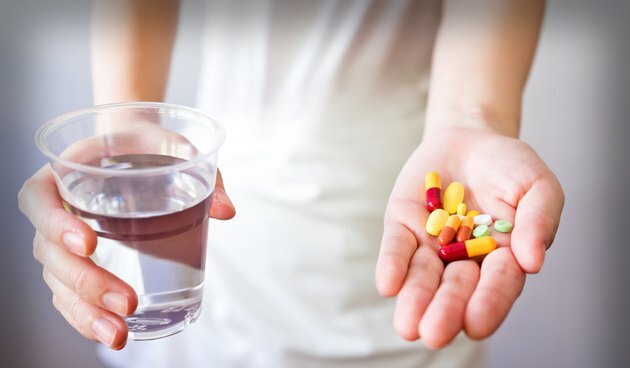 Finally, magnesium supplements can interact with medications like some antibiotics and blood pressure medications, so consult your doctor before beginning a magnesium supplement regimen.